The New Disney Dream Does Not Feel Very Big or Crowded! : Clever design and well though out deck plans keep the intimate feel on board Tigger Travels - Family Adventure Journal Photos From Tigger`s Travels and MORE! 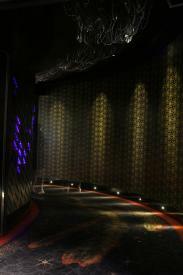 Curved section in back of Cabanas. Curtains are drawn at night, normally outdoor seating is visible. Having been aboard Disney Cruise Line's first two ships for nine cruises in the past seven years, our first concern about cruising aboard the new larger Disney Dream was that it will feel crowded, loosing the intimate feel of the smaller ships. We had cruised on the Royal Caribbean Mariner of the Sea that frequently felt too big. It was easy to feel overwhelmed by the crowds in large cavernous spaces. The main shopping area was very nice, but when over a thousand people gather it was too much. Then there was the long lines for food, on occasion it made the trip trying. 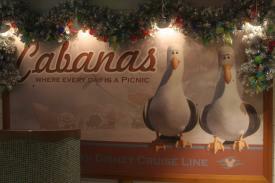 amazingly we never saw a line of more than a few people in Cabanas. After being aboard for two days, I realized what Disney engineers had done to create this feel. The architects of the Dream used three features to keep the feeling of intimacy in the larger ship; curves, divisions of space and shorter straight lines. By carefully manipulating space the only time we even saw a large crowd was at the Pirates in the Caribbean party when it was expected. 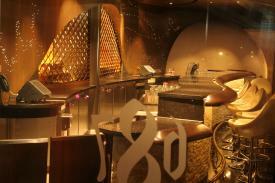 Curves can be seen most clearly in Cabanas and the District, the area that becomes adult-only after 9:00 and contains a couple adult-only lounges all day long. In Cabanas, there is one large eating area that is arranged in a semicircular layout similar to the Beach Blanket on the Wonder and Topsiders on the Magic. Sight-lines are broken so that at no time will you be able to see more than a hundred guests at one time sitting at their meals. The best illustration of these curves is seen in the District. 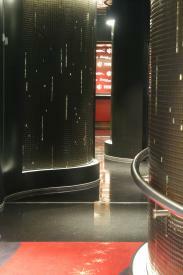 Located on deck 4 aft, this area can be access from the outdoor promenade or from indoors mid-ship past the art gallery. There is a single passage that connects all six lounges that meanders from the port side, diagonally to the starboard side then back to the port. This passage has very few straight lines and employs dramatic curving walls and round spaces to reduce sight lines and noise. With a possibility of seven distinct areas of the District crowds are actually smaller than the same crowds in the three (or four) available spaces on the smaller ships. These curves also give the ship a more organic feel throughout the ship without evoking the expected sea-sick feeling that I expected. Small seating area in Cabanas. Notice one of four drink stations at far end. 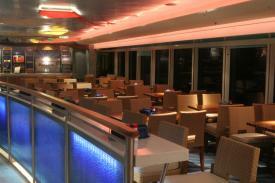 Divisions of space keeps the small feel in the larger Cabanas restaurant on deck 11 aft. This is the place that serves food throughout the day but smaller seating areas and stations in a cafeteria style floor plan make it easy to navigate. Unlike the equivalent restaurants on the Wonder and the Magic, the seating area in Cabanas is divided into six area; five indoor spaces and one outdoor space. 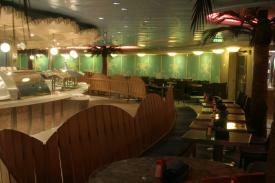 Not only is there ample seating, you never have a complete sight line that allows a guest to see much of the crowd. This cuts back on both sound and the subconscious feeling of being in a huge crowd even though there is plenty of space for everyone. 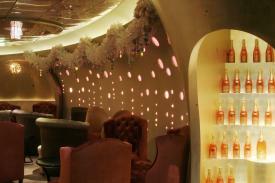 Curves in the Pink lounge make you feel like you are sitting in a full champaign glass. Secondly, the serving area of the restaurant is not organized as one long food line on each side of a single buffet with plates on the start and drinks at the end. That works fine on the smaller ship's capacity of 2600, but with a capacity of 4000 guests lines and wait time are virtually eliminated. Plates and flatware are available about every 20 feet or so. Drinks are served, not from the 'end of the line' but from four separate stations throughout the restaurant that are never crowded. Food is divided by nationality and type in smaller walk-up sections where individuals spend only a few moments looking and getting servings of their desired dishes. Finally, there is plenty of space to get around the occasional line that may form in one spot or another keeping traffic flowing at all times. On a cruise ship there are a few times passengers expect long straight lines. On both the Magic and Wonder the long corridors used to access cabins can be almost dizzying to go from one end of the ship to the other. On the Dream there are no corridors that are half as long as the ones on the smaller ships, a real surprise if you are used to cruising. To make shorter straight lines there is as many as four dog-legs on a single deck that keep the sections short and manageable. Also, more decks incorporate a walk-around to get from one side of the ship to the other in as many as nine places along the deck. With all the turns and cross-overs the ship actually feels smaller than the smaller ships. At the same time, it is harder to get lost than the smaller ships since there are fewer dead-ends. Over-all, it seems that Disney Dream was designed with more intelligent design than any of the eight cruise ships I have been on. Once again the company known to set high standards in the entertainment industries has raised the bar for all cruise lines when designing such large ships. Disney Cruise Lines proves one more time that the guest is the most important feature of their property, not an accounting formula that tries to get the most dollars out of every cubic foot of space. Thank you, Disney. We are happy to be booking cruises on all the ships you operate!